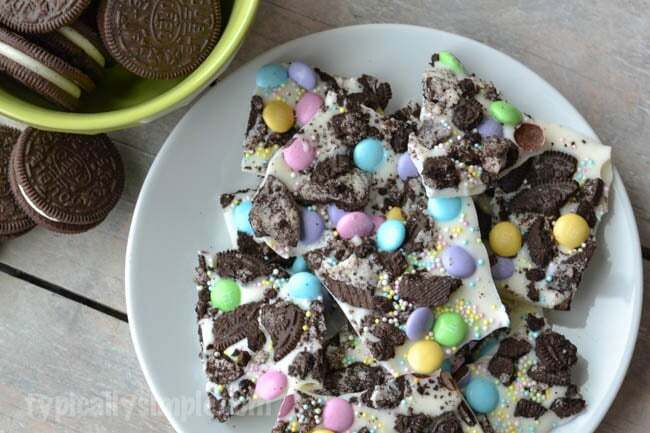 Packed full of pastel colored M&M’s, this white chocolate Oreo bark recipe is a simple and delicious treat for Easter! I probably say this every year, but never have I ever been more ready for spring! We got a taste of warm weather last week and then got snow a few days later. Luckily it’s melting pretty quickly, but there’s a little guy who is ready to get outside and I just don’t feel like dealing with snow boots & mittens anymore! So in spirit of celebrating all things spring, even if the weather isn’t cooperating, I thought it would be fun to make some treats with spring colored M&M’s. Around Christmas, I saw a lot of peppermint bark recipes being shared. And believe it or not, this chocolate lover had never made, or even eaten, any sort of bark recipe before! So it was on my baking to-do list. 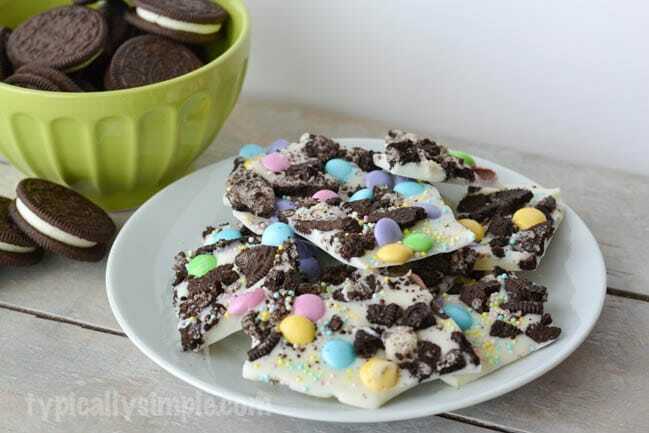 With Oreos, M&M’s, and sprinkles, this bark recipe is the perfect spring inspired treat! To get started, crush up the Oreos into small pieces. I find the easiest way to do this is put them in a ziplock baggie and crush them by hand. You can also try crushing them with a meat mallet, but don’t get carried away pounding them like I did and end up with a mess. Next, melt the candy melts in the microwave or on the stove. Usually I melt them in the microwave at 50% for 30 seconds at a time, stirring until they are fully melted. Place parchment paper on a baking sheet and pour the candy melt over it, spreading it around with a spatula or spoon. Sprinkle on the crushed Oreos, M&M’s, and sprinkles. Now for the hard part…the waiting. Pop the baking sheet into the fridge for about 10-15 minutes so the candy melt sets. Once it has hardened, break it into pieces for eating! Yum! I first shared this recipe on Club Chica Circle as a contributor.